Hi everyone! It's Jackie here with a fun project to get you a little organized for the holidays! I don't know about you, but I make a Christmas list every year but never seem to have it on hand when I need it most! Well, this year, I decided to make myself a little notepad that I can carry in my purse and pull it out whenever I need it! I recently ordered some long notebooks and couldn't wait to make this project! The notebooks measure 2 1/2" x 8". For the notebook I cut a piece of cardstock 6 1/4"x8 1/4, scoring along the 6 1/4" side at 3" & 3 1/4". 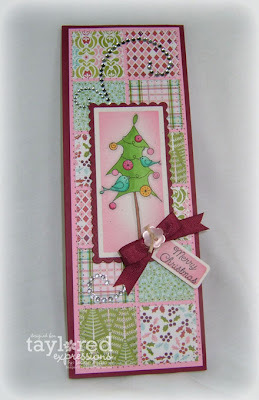 I used the darling whimsical tree from the new Taylored Expressions set Wings of Joy. It was stamped in Memento Tuxedo Black, colored in with Copic markers and cut out with Rectangle Nestabilities. I sponged some Pretty in Pink (SU!) ink on around the edges of the image before removing it from the die. Love the look of the white edge! The quilted block background was made with the new Eskimo Kisses DP from Basic Grey and a 1 1/4" square punch. I adhered them to a piece of Pretty In Pink cardstock and then used my sewing machine to give it a quilted look! The sentiment was masked and then cut out with the Tag Trio dies from Spellbinders. Again, I sponged a little bit of Pretty in Pink ink around the image before removing from the die. A little bling, ribbon and button and I was done! I just love this little notepad! Here is a little bit different view! 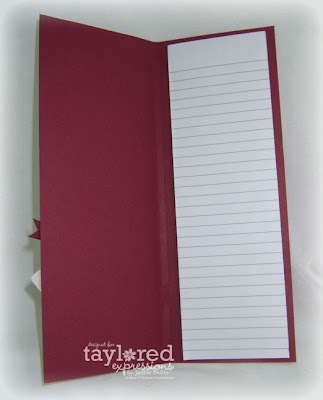 Here is a picture of the notepad itself! The notebook was adhered to the inside with some red line tape. I can't wait to put this to good use! I hope I gave you some inspriration to make one of these yourself! They really are so easy! Did you know that Taylored Expressions has a monthly newsletter? It's so easy to sign up! Just head on over to the Taylored Expressions Website and enter your email under the "join our mailing list" icon and that's it! You will be informed of any new releases and and all of the new "Fresh From the Oven" products in the store! Oh my goodness - this is adorable! I've been wanting to make some skinny notepads - love your quilted look! This is absolutely aamazing! I love the idea, very handy! The quilted look is great, I just adore Eskimo Kisses!! Your coloring on the tree is great and the sponging really makes it pop, I love the white border too-LOL!! Love the swirly bling! Great job Jackie! I love the colors - fabulous project! What a super cute notepad Jackie!! Love the quilted background look!! What a GORGEOUS Idea and FABULOUS execution Jacks! I ADORE this! !